iSkin Aura iPad Case is a multi-functional folio case that protects your iPad and can also be used as a stand. The Aura flips open and is transformed into a typing stand. Its three angle positions also quickly converts to a viewing stand for your iPad. The sleek design and light weight material with a metallic-brush fabric makes this an elegant folio iPad case. 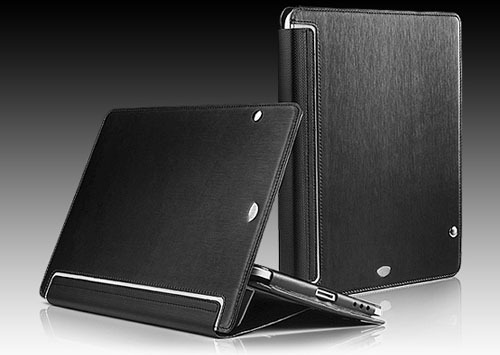 iSkin Vu for iPad is a hip, sleek and slim-fitting cover that is both elegant and practical with hybrid protection. iSkin Vu blends environmentally-friendly soft rubberized polymer with patterned hard transparent plastic shield. The iSkin Vu has an unique rear-bottom hatch that can be easily removed to allow the iPad to dock without having to remove the case from the iPad. The hatch has a charging cable opening that lets you charge the iPad while keeping it all covered. Choose from 7 high-gloss colors for your iPad.